My hosts here at Madison took me into their administrative offices this morning to meet the staff, etc., and I noticed something on their doors that pricked at my subconscious. I quickly forgot about it, though, in the rush of meeting new people. But as I was brought around to their various offices, one of the staff pointed out his "door-dec" which I then realized was laid out to mimic the A.D. hardcover! 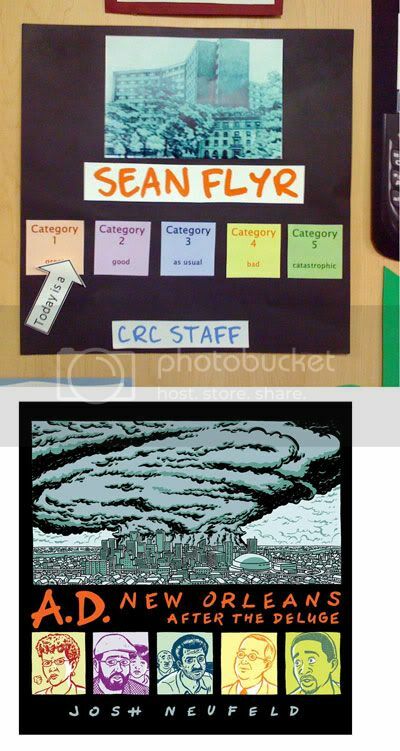 As you can see here, instead of the hurricane looming over New Orleans, it shows the CRC‘s main building, followed by the staff member’s name where the A.D. title would be. Then, where in my book are portraits of my protagonists, is a very clever gauge which the occupant can adjust depending on their mood, from "Category 1: Great," to "Category 5: Catastrophic." I love the way the sign refers to both the different categories of hurricanes but also ominously evokes the Homeland Security Advisory System "terror alert level" charts we all become so acquainted with during those dark days after 9/11. Door-decs (e.g. door decorations) like these are on each dorm room door throughout the CRC. I believe they are created at the beginning of the term as a community-building exercise. Pretty nice shout-out to A.D., and in my opinion a very clever way to add personality to the institutional university decor. I hope I get to meet the student who came up with the concept. Denise was the CCC store? Really? It’s funny she doesn’t remember being there.